Your stove is a critical element of your kitchen, it helps you create both nightly dinners for your family and holiday creations for guests. There are a large number of stove models and styles available, making it quite difficult to narrow down choices should you be shopping for one. But whether you choose an Amana, Hotpoint or Samsung range, you may have to decide whether you want it to be gas or electric. You may have owned both gas and electric stoves over the years and have a preference. But then again, maybe you are only familiar with one or the other and would like to know the pros and cons of each. 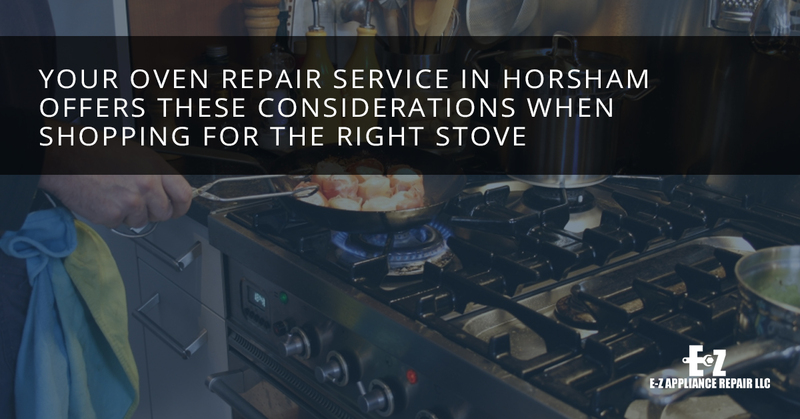 Your oven repair service in Horsham offers these considerations when shopping for the right stove for you. While this may be somewhat subjective, one advantage gas ovens have over their electric counterparts is in the quality of the whole cooking experience. Gas stoves have consistent flames that can be easily and quickly adjusted. So when the pasta you are cooking starts to boil over, a flick of the wrist immediately dropped the flame and temperature, saving yourself from certain disaster. If your home is already equipped with a gas line, a gas stove will cost you less to use on a daily basis than an electric range. But if you don’t have a gas line, you might want to consider the cost of having to set one up. In many cases, you are going to spend more money on the initial purchase of a gas range. Gas ranges generally cost more than electric ranges plus there might be additional costs having it hooked up in your home. Something to consider. There is also the safety factor to consider. Gas can be a potentially harmful element if leaks develop. Many people believe that electric ovens look really nice as their glass cooking surface can add a little flair to any kitchen. In addition to their good looks, these glass surfaces are far easier to clean and maintain than gas stoves. Gas stoves require the removal of heavy burners and plates to clean up spills. Another pro electric stoves enjoy in in their ease of use. As long as it’s plugged in, all you need to do is turn a knob and you are ready to cook. The smooth top of an electric range offers a solid spot to rest pots and pans and most electric ranges have extra storage under the oven. Electric ranges are less expensive than gas stoves and are very easy to set up. Electric ranges tend to cook food slower than their gas counterparts, plus it’s difficult to tell if you have your stove on the proper setting as you don’t have an open flame. If you wind up losing power in a blizzard, you might starve. Well, that might be an exaggeration. But with a gas stove, you can still enjoy a hot bowl of soup and hot tea in the event of a power outage. So there you have it, all the information you need to make an educated decision.